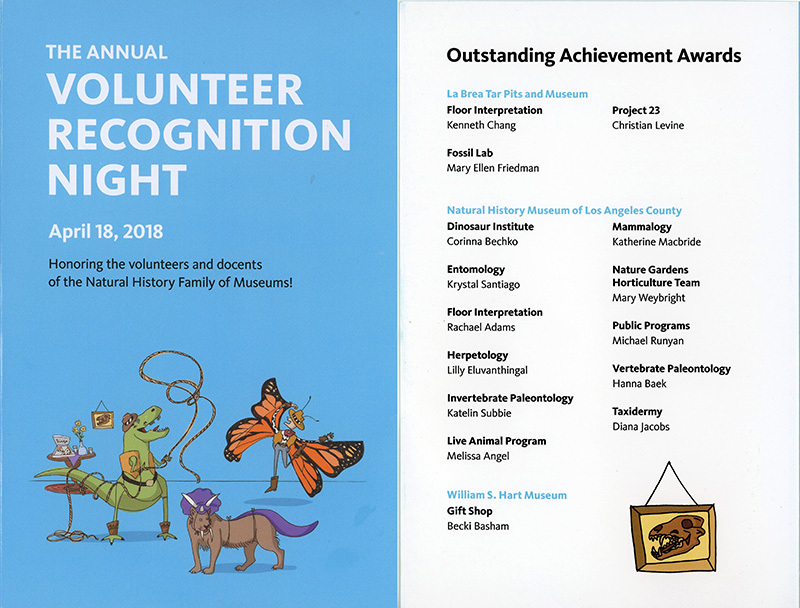 SCVHistory.com LW3252 | Hart Museum | County Museum System Honors Hart Volunteers, 4-18-2018. 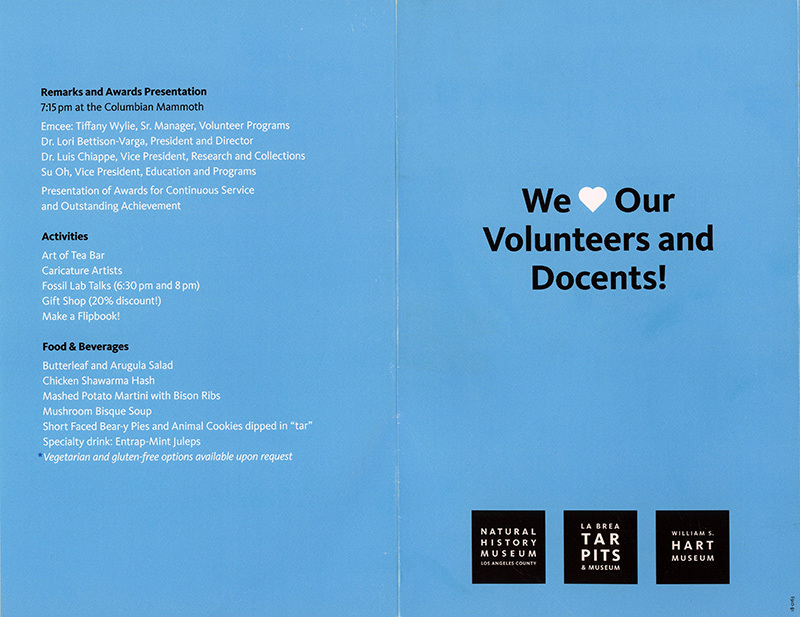 County Museum System Honors Hart Volunteers. 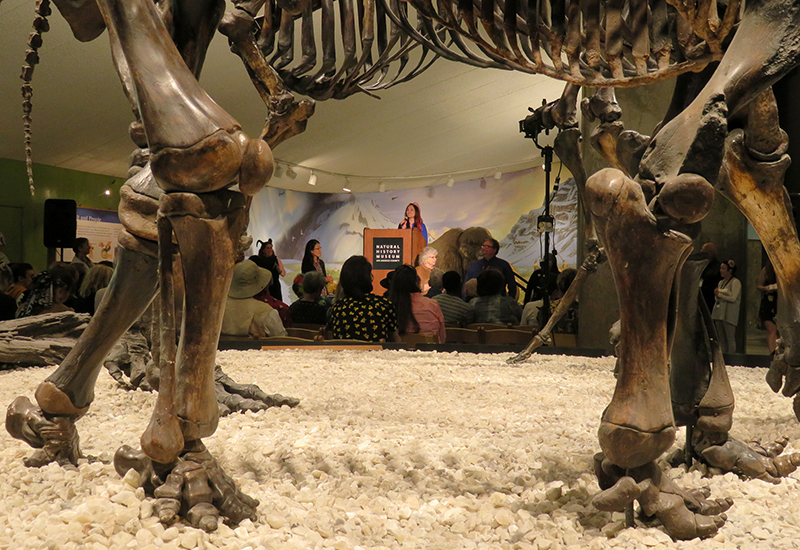 Surrounded by mastodons and saber-toothed cats, the Old West met the Really Old West when a trio of volunteers from the William S. Hart Museum in Newhall received special accolades Wednesday at the La Brea Tar Pits. 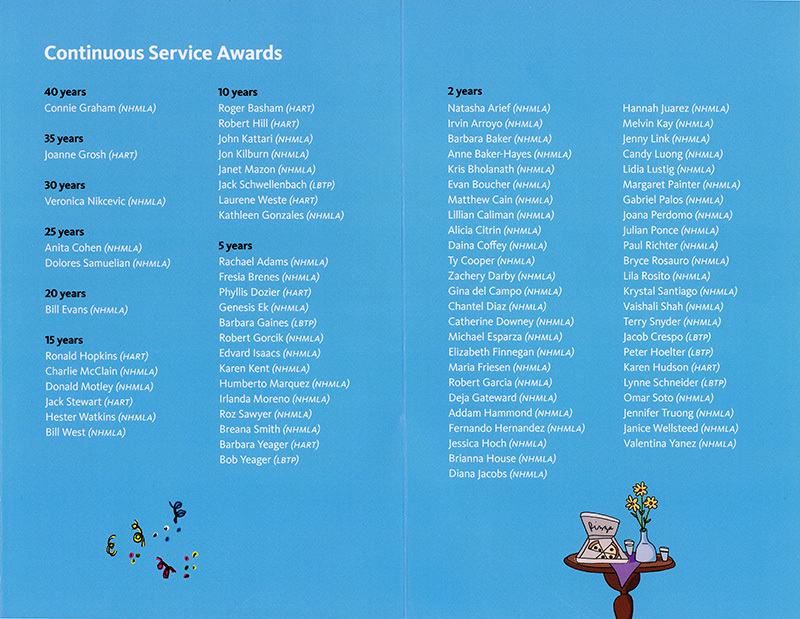 The occasion was the Natural History Family of Museums' annual volunteer recognition night. The "family" includes the Hart Mansion, the Tar Pits, and the eponymous museum in Exposition Park. Newhall resident Becki Basham was selected for an outstanding achievement award for the 12 years (so far) that she has put into managing the Hart Park gift shop. Proceeds from the gift shop enable the nonprofit Friends of Hart Park and Museum organization to host events at both the park and museum, and to purchase necessities that aren't covered in the county budget. Back in '06, Becki read an article probably much like this one about volunteer opportunities at the Hart, and she decided then and there to see what she could do. One six-week training course later, she was practically running the place. You can give her a hearty handshake this weekend when the Santa Clarita Cowboy Festival rolls into Hart Park. Becki and husband Roger, who runs the book store, have hand-picked a number of "cowboy" offerings that they'll be selling at old-timey bargain prices in the gift shop. If a dozen years seem like a lot of volunteering, consider Joanne Grosh. 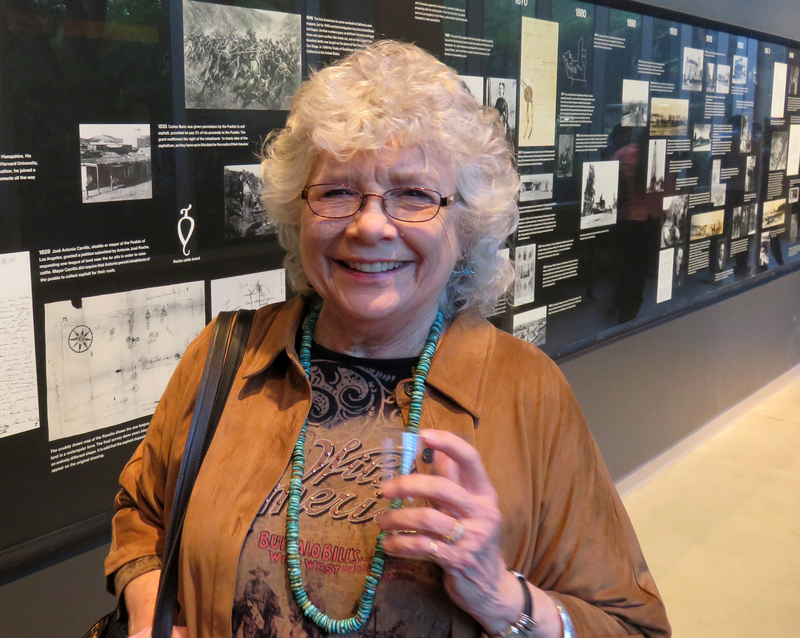 She was honored for 35 years of continuous volunteer service to the Hart Museum. Emphasis on "continuous." No breaks. No years off. The Natural History Family of Museums doesn't fool around. You can't go away and come back later and expect to get a 35-year pin. Grosh got hers Wednesday. You're sure to find her in the gift shop this weekend, too. 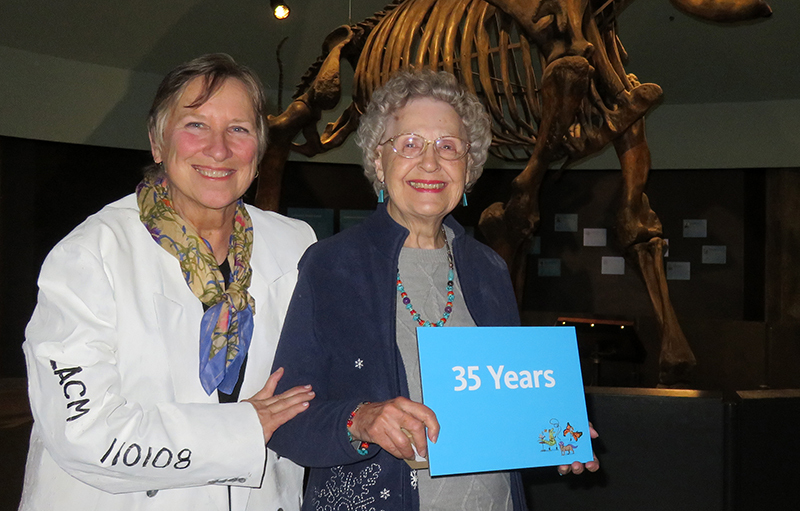 Hart Museum Director Margi Bertram, left, with Joanne Grosh, recognized for 35 years of continuous volunteer service. Click to enlarge. When you hike up to the mansion, you're likely to bump into John Smith. The real John Smith. Tall man in a hat. He's been at it only a couple of years, but now that he has retired from his regular teaching job, he's a fixture at the mansion where he teaches visitors about another tall man in a hat who used to live there. Smith also enjoys conducting research into Hart's life at USC's Seaver Center, the official repository for some 100 boxes of Hart memorabilia. Hart gifted it, along with his property in Newhall, to the county of Los Angeles upon his death in 1946. Museum officials announced Wednesday that Smith will be the one and only volunteer to represent the entire family of museums at the annual L.A. County volunteer recognition event next week. 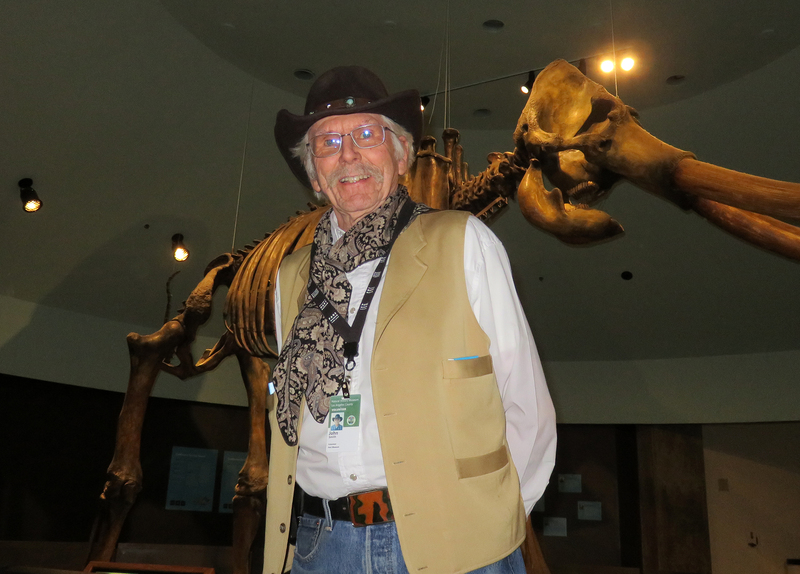 The Hart's own John Smith will represent the Natural History Family of Museums when the county honors its volunteers of the year for 2018. Click to enlarge. 5 years — Phyllis Dozier, Barbara Yeager. For a guided tour of the Hart Mansion led by one of the Hart's outstanding volunteers, stop by any day except Monday or Tuesday. Hours are Wednesday through Friday from noon to 3 p.m. (last tour at 2:30 p.m.); Saturdays and Sundays from 11 a.m. to 4 p.m. (last tour at 3 p.m.). Starting June 28, check here for summer hours. 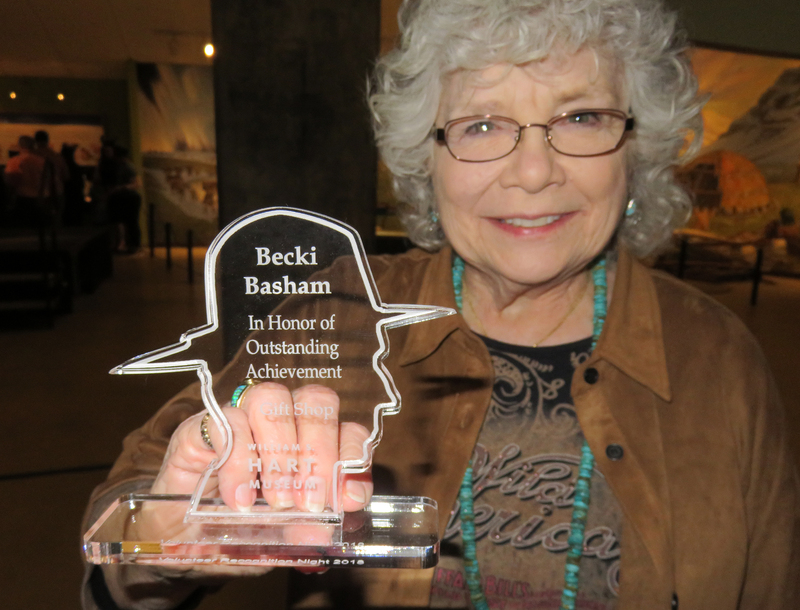 To find out how you can take the same volunteer training course Becki took and get yourself fixed to earn your own outstanding service award one day, call the museum at 661-254-4584 or email: information@hartmuseum.org. Above: Can you find Becki in this picture? Click to enlarge.